The 8 megapixel camera in the iPhone 4S may shoot 1080p HD video, but that quality won’t matter if you can’t keep a steady hand. At Macworld | iWorld 2012, iSupport debuted three iPhone mounts for video enthusiasts who want to make sure they capture stable, high-quality footage. 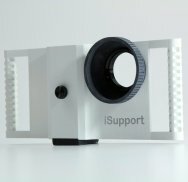 The basic $49 iSupport is a lightweight mount made of ABS polymer. It features an iPhone holder that comes in two sizes. Choose the smaller one for a naked iPhone or the larger one if you use an iPhone case (even if it’s big like the OtterBox). A rubber hood surrounds the iPhone’s camera, cutting out lens glare. You can also thread any 37mm lens—the standard camcorder lens size—onto the mount. There is a handle on each side, making it easy to grip the iPhone while shooting. I got to play with the iSupport and liked the way it felt while shooting video. The accessory is light, but sturdy, and feels good in your hands. The handles on the iSupport made it easier to pan across a scene, and I preferred it to the OWLE Bubo, a heavier, metal alternative. For more advanced shooters, the $79 iSupport Pro offers a few more features. The accessory’s clamshell iPhone holder protect the phone and adds a bit more centered weight for steadier shots. iSupport’s $189 Cine Bundle takes things to another (perhaps excessive) level. The Cine Bundle is made of aircraft grade aluminum, according to the company. 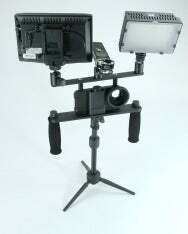 There are three tripod mounts on the bottom and two mounts on the top for attaching an assortment of accessories, like strobe lights or mics. You still get the rubber hood, but the handles are larger and more comfortable to grip. If you want to turn your iPhone into a studio-level device in one package, this is it. Lenses, tripods, and other accessories are not included with any of the mounts. See the iSupport mounts at Booth No. 958 at this week’s Macworld | iWorld show in San Francisco’s Moscone West exhibit hall.